Hi, I am interested in your 1957 Cadillac Eldorado (stock #4748-CHA) listed on Autotrader for $102,995. I'd like to get more information about this vehicle and confirm its availability. If youre a Cadillac fan, then you already know the rarity and desirability of a 1957 Cadillac Eldorado Seville... but thats just the beginning. Because this is a full custom restomod that includes a modern luxury interior, performance suspension, and a modern fuel-injected V8. And this fresh build is all wrapped around a slick total presentation. Just like you, everyone else is going to say WOW! from the first impression. Theres only 300 miles on this car since its full custom build, so the Bright Ruby Red paint looks terrific on the expertly restored sheet metal. You can tell there was a true eye for a custom presentation in all the detail from the expertly shaved trim (including door handles) to the large BOSS alloys. But as much at this declares a custom restomod from the first glance, it also respects its history... and for a very good reason. The Eldorado Seville coupe took the Series 62 styling to a new level with a unique rear end that was arguably sleeker and more artful than any other car of its era. They were also expensive, which led to only 2,100 built in 57. We know you are looking at all the detail pictures to make sure all that intricate chrome trim is in place. So were happy to tell you this car is complete and mirror-like from the Dagmar caps all the way down to the trim within the unique tailfins. Speaking of the rear section, no one did it better than Cadillac in the 50s. With the split bumper and integrated taillights, this is pure sculpture on wheels. Inside, the full custom attitude continues. The seats look terrific with a pattern that includes ostrich inserts and a hint of bright trim in the tan buckskin leather. And yes, everyone gets the comfort of individual buckets front and rear! Take some time to look over this full presentation, because the seats coordinate with the door panels, dash, and trim all around the car to create the kind of uniform luxury that would make a modern Caddy jealous. Speaking of modern, you also wont go wanting for amenities. Power windows, power locks, cup holders, and ice-cold air conditioning keep you in complete comfort. Plus, the Kenwood AM/FM head unit is your gateway to all the best infotainment technology, including Bluetooth, satellite radio, GPS navigation, and a back-up camera. Dont forget that this is a driver, too, with features like a custom chrome steering wheel, Lokar shifter, and full custom Dakota Digital gauge panel glowing red like the exterior. Cadillacs of this era came with a V8, but they were never anything as advanced of as powerful as whats under the hood of this special coupe. Its a 5.3-liter LS-series Vortec V8. The modern fuel-injected motor has been expertly added to this classic with a color-matched presentation and plenty of Cadillac badging. And it has all the right supporting components from a hi-flow air cleaner to a large aluminum radiator. Headers feed straight pipes and a glasspack-style dual exhaust, so you know this restomod makes a terrific rumble. But dont just listen to this high-performance soundtrack; follow its path in the undercarriage photos. There youll see the exceptionally cleanliness that comes from a coordinated and thoughtful build. While this all looks fantastic, dont forget that this was also built to be a driver. The Fatman front suspension, ladder bar rear, large front disc brakes, rack & pinion power steering, and adjustable coilovers behind each wheel make this a terrific anytime choice. There even a modern 4L60E four-speed automatic transmission with highway-friendly overdrive in case you want to go on the Power Tour. This is the fully-finished and award-worthy restomod that has everything you want. 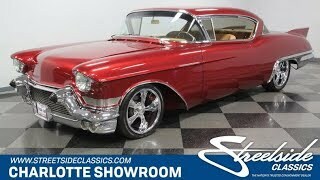 And since its wrapped around one of the most desirable vintage Cadillacs ever, you know this a true one-of-a-kind. Call now!